Buy Meridian Organic Crunchy Peanut Butter 280g in the UK from our online shop or directly from our independent Scottish store. Meridian organic crunchy peanut butter, as with ALL Meridian products, does not use palm oil as an emulsifier. Also available in store in 1kg size! A delicious, seasonal recipe by popular brand Meridian made with peanut butter and tomatoes. This recipe contains 3tbsp Meridian crunchy peanut butter. Where can you buy real Crunchy Peanut Butter - Organic safely online? 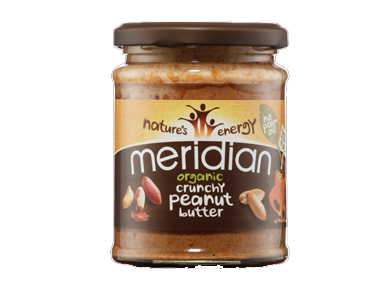 If you are wondering where you can buy Meridian Organic Crunchy Peanut Butter 280g safely online in the UK, then shop with us. Crunchy Peanut Butter - Organic - Meridian Organic Crunchy Peanut Butter 280g in Nut & Seed Butters and Foods.